Attendees will have access to nationally-known expert engineers and technicians who will discuss the most up-to-date techniques and processes for efficient operations. Roundtable discussions following each session will allow participants to exchange ideas and share information. Discussions and dialogue will revolve around actual problems and realistic solutions. * Agenda items to include topics such as What's New; Electrical Maintenance & Upgrades; Reducers, Gearboxes & Couplings; and Problem Solving & Troubleshooting. $275.00 per person includes all sessions and events. Transportation from the airport to Sheraton Station Square can be arranged near the baggage claim area. Super Shuttle (1-800-Blue-Van) is located next to the Alamo rental car counter. For return to the airport, call 24 hours in advance to arrange for pickup. Taxicabs are also available. A block of guest rooms has been reserved at the Sheraton Station Square until August 20, 2012. The special rate is $169 per night. For reservations, contact the hotel toll-free at 800-325-3535, or direct at 412-261-2000. 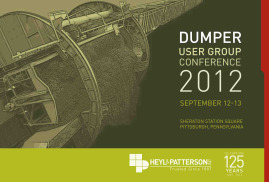 Be sure to identify yourself as a member of the Heyl & Patterson Dumper User Group 2012. Register before August 12, 2012 and receive a 10% discount on your annual dumper inspection. Please make payment of $275.00 per attendee. Registrations must be made by August 12, 2012.